The new baby will sleep in our bedroom for the first few months. After that though? We’re not sure yet. Two kids could share a room of course, but we have enough space in this big old Victorian for each child to have their own. Another option would be closing off the room that’s adjacent to our bedroom, but we’ve come to really enjoy that as a family space. So I came up with a brilliant solution — although Brandon is not convinced of its brilliance yet. If we turn the former kitchen on the second floor (a sort-of craft room right now) back into a bedroom, we could all sleep on the same level. Eleanor and August both stay put in the rooms they’re in now, and the baby gets the new space. We would have to remove the sink and its cabinetry, remove the water and gas hookups in the room, and close off some of the doorways. Easy enough. We would likely demo the wall of cabinetry, too. It could be reused as built-in storage (drawers for clothes, cabinets for toys, etc. ), but it looks very kitchen-like, and freeing up that wall for furniture placement may be better for a bedroom. Ah, but then it wouldn’t be quite that easy! The wood flooring in that room is newer than in the rest of the second floor and it’s slightly raised, so it’s likely that it was laid on top of the old stuff. That’s fine, but did they go under the cabinetry? My guess is no. The flooring would probably need to be addressed. Also, the hallway would need to be reconfigured, which means we lose the built-in storage that’s there. That is the main reason Brandon isn’t convinced of my plan. The bathroom itself only has a medicine cabinet for storage, so we fully use and appreciate the extra drawers and cabinetry right outside its door. The back stairway is on the other side though, and the kitchen serves as access to those stairs and a bedroom. The house’s original layout would have had the hallway continue uninterrupted, and that’s the layout we would be returning to. We’d lose the built-ins and gain a fourth bedroom on the second floor. We’re still thinking our options through, so we haven’t figured out exactly what all of this would cost yet. We could do a lot ourselves, but realistically, I’m a pregnant lady and we already have two young kids underfoot so we’d have to hire out for at least some of it. My mom suggested doing the conversion in stages. We could demo what absolutely needs to go now, smooth the walls and paint, and just live with the weirdness of having to pass through the baby’s room to get from one side of the second floor to the other. Then in a couple of years when we’ve saved up a bit of money again, we could finish the renovations. When I was a little girl, my younger sister’s bedroom could only be accessed through mine. We shared a room for many years in an apartment after that, but then in another house, I had to go through my sister’s bedroom to get to mine. So maybe my mom and I are biased toward making weird spaces work? What do you think? Third floor bedroom? Convert the easier room next to our bedroom (and keep the second floor kitchen as-is)? Go all-out with changing the kitchen back into a bedroom and opening up the hallway, or do the work in two stages? Previous Post For the Fairies. And Zombies. I’d think I’d go with room sharing until they’re old enough to think a room in the attic away from everyone else is cool. Scarily enough, that’s not that far away! I think whatever you choose to do will work for you – you’ve made such wonderful and creative choices in the past. My only alternative suggestion would be swapping the tv room off your bedroom with the kitchen. My littlest was in a nursery in a room connected off my bedroom. It was so divine to have her separated in her own room, but able to scoop her up in a second when needed. The built ins in the kitchen could be really useful in a tv room! When my daughter got older – we did a shuffle of rooms and she’s now downstairs, and the nursery is my sewing room. You could equally do a shuffle down the road if you didn’t want her room connected anymore. True, we could always shuffle around again. I love this idea! Great job Amy! I second that Amy! This also allows you more time to determine what your needs will be. We have our son and daughter sleeping in the same room with the majority of their toys in another room. Have you asked your kiddos if they want to move to the attic room, that’d be my first thought… Second would be turning the room off your bedroom (the family space) into the baby’s room, and using the kitchen as a family/crafting room. Last thought, if you do end up converting the kitchen to a bedroom, keep the wall of cabinetry, but lose the drawers under the middle section – it would look like nothing more than built-ins on either side of a desk (both bedroom and Victorian appropriate). Good luck, and congratulations! August would be happy to take the other bedroom, so he’s probably the one that would be moving. I should have mentioned in the post though that we have a third kitchen on the third floor (I know — it’s weird) that we could relocate the craft room to. I actually like that option, because then it’s closer to the play room, which has just a handful of arts and crafts stuff in it. Perfect! Move the craft room up to the third floor next to the playroom and move the family room into the second floor kitchen. How about the family space as the bedroom and the kitchen as the family space? I love the built in in the kitchen (I agree with Suzanne–you can use it for a changing table and then a window seat) and I can understand why your husband doesn’t want to knock down the one in the hallway. But that’s just me. I understand not wanting to get rid of the storage in the hallway too! We definitely make good use of it. We live in an old quirky house with no hallways, so you have to walk through every room to get to another. Currently our only bathroom can be accessed through our youngest daughter’s bedroom. Thankfully, she sleeps in her sisters bed and this room really functions as a playroom, but it’s still weird for visitors to understand! You just have to make an old house work for you :). We all get used to some quirks in our houses, don’t we? Built-in, built-in, built-in! Ha. None of those are original to the house, but they are well done, and the storage is nice. You know how much I like to move walls around (maybe not, actually, I haven’t shown the befores). I totally vote for reconfiguring that kitchen, long term it makes the house much more useful. I would probably keep those cabinets by the window though, at least for now. I’m also a big fan of keeping all kids and parents on the same floor when everyone’s small. I want to see your befores! I’ve seen little bits that you’ve posted, and I sort of know some of what you’ve done, but not everything. And I think everyone is in favor of keeping those cabinets (except for me). I think it would be great to use the kitchen as a bedroom. What if instead of removing the whole wall of built-ins, you just removed the top half? Then you wouldnt have to worry about the floor, and you could put some fun shelves or art on either side of the window. Plus bonus storage in all of the drawers. Maybe skip the hallway project for now- babies don’t really care if you walk through their room. Or- you could make the room a couple feet smaller and open up the hallway? Slide that blue wallpapered wall over a few feet and keep your hallway storage, or heck, even add more. I thought about that, but then we either need to relocate or add a radiator, so it’s still a big job. 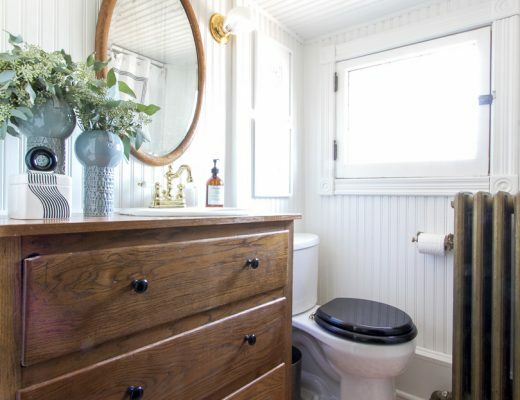 It does keep the bathroom storage intact, but it’s a little bit of a waste of square footage with the way the back stairway would connect. Like the idea of the old kitchen as the bedroom! It will make your life so much easier having them all on one level! Could you leave existing floor to ceiling built-ins as storage (most baby clothes are folded anyway) and paint them, get a cool armoire for the hanging clothes, then pull out sink , get a great piece of marble or something and turn it into a modern changing table? We still fold all of the kids’ clothes, so I’m not too worried about hanging clothing storage yet. I’m not sold on keeping the sink though! My instincts lean towards using the easier room adjacent to yours. Having a family space is nice, but you also have 2 other floors of what could be family space. Alternatively, using the second kitchen as a room would be cool, and I think the built ins would still work in that scenario (and it seems that everyone else does too, lol). Or asking one of the older kids if the upstairs sounds like something they would like? August would be happy to take the upstairs bedroom if that’s what we decide to do. I think I’m hesitant to convert the admittedly easier room (next to ours) because it’s one of the things we really like about this house. It’s cozy and tucked away, but by being open to the bedroom, it still feels spacious and gets lots of light. It sounds awesome to have that space there. Tons of opinions floating around in the comments. Go with your gut! I know you prefer to keep the room next to yours as a family space but could the kitchen not work for that purpose? It seems if you flipped those spaces (kitchen would become family space, family space would become baby room) you wouldn’t have to make some of the adjustments that would be needed if the kithcen had to be converted into an actual bedroom. Some of the kitcheny items could even stay in a family space like the cabinetry which could store games, snacks, etc. I really like the family space being open to the bedroom though — at least right now while the kids are still little. Sometimes (like right now!) I can be in the bedroom working on my laptop, and Brandon and the kids can be playing in the next room over. Separate, but still connected. If either of the kids would like the baby to share their room, that would be easiest. We did this with our girls and it was not as tricky as I thought it would be. Alternatively, I vote kitchen as bedroom. Just lose the sink. Keep the built in for storage (those upper bits could act as closet, no? ), and paint the insides a bright color. I don’t think having to go through a room is a big deal at all. And in 3 years or so, Eleanor will be begging you to move up to the 3rd floor and you can rearrange. I would use the old kitchen and take out the dresser under the window, but leave the rest of the built-ins along that wall. Then I would build a window seat there with some open shelving under it for baskets or pretty toys/styling. If the dresser part can be taken out in one piece, I would wrap it in wood/hack it and make that a furniture piece changing table and put along another wall. I would take the sink and cabinet out. That cabinet could also become a changing table or an outdoor kitchen prep area if it has a cover to go under… Just thinking out loud. I would have to see the floor plan to say about the hallway. I like the idea, but your built-ins out there are super rad, so I would worry about taking them out. Like many other commenters (and yourself! ), I think it’s a good idea to keep young kids on the same floor as you. The second-floor kitchen looks like a good solution, and I like your mom’s idea of doing it in stages. However, I would have the hardest time taking out the wall of cabinetry! Personally I’d try to make it work somehow (which would also save you the rework of the floors). But only you know what will work best for your needs. Everyone wants to make the cabinets work! I’m not against it, but I’m not strongly for them either. I am in the process of buying cabinetry for my kids rooms! I would kill to have that awesome vintage storage in my house! I think the cabinetry looks great as is and chime in for leaving it there. I’d keep it simple and put the baby in the family space or in the slightly altered craft room. The baby might be a great sleeper, but you don’t want to be running up and down those stairs or worrying if the baby is too hot or too cold! In a year or so the baby might want to share a room with a sibling (our boys share even though we’ve always had enough rooms for them to have their own) or one of the older kids might want to move upstairs. And I think down the road, one of the kids will definitely want to move upstairs. You have so many options in your spacious house! Phew! That’s a big project! But you know, those cabinet built-ins don’t look TOO kitcheny. You might be able to repurpose them. If you take the doors off the upper side cabinets and turn that into open shelving, it might look more bedroomy. While the baby is little, the extra door access might be handy but you’re right, that extra storage is going to be tough to lose. There must have been some kind of linen closet originally. I wonder where it went? This house has changed a lot in its nearly 125 years, so it’s hard to say. Here’s an idea – What if you made the top floor into a kids sleeping room with mattresses on the floor under a teepee or fabric fort and encouraged the biggest kids to camp out there for a while. If either (or both of them!) took to it, it might make the transition to moving one or both up there when baby comes? I love how you let a little older Eleanor have more control in her bedroom design. Maybe August gets a choice of what room he wants (his current, upstairs or next to you) and if the upstairs is really cool, maybe he’ll just swap and let baby have his? Of course I don’t have children yet and I’m sure you’re going to make the perfect nursery where ever is goes! Any chance you could post an overhead (estimated) view of the floor plan of the space? Might be a cool way to get some feedback. I have an idea, but I was wondering if I was looking at the pictures incorrectly. I’ll consider posting a floor plan of the room and hallway. I feel a little funny about posting all of our exact bedroom locations. Ahh, this is much easier. I was trying to picture it when you were describing it the other day. You know, it might be quite handy to have the sink and such in the nursery, no? I know there’s a concern about the heat upstairs, but could you just add a small window unit to help with that? The built ins in the hallway are gorgeous! I’m sure it’s a tough decision whether to tear those out or not. Good luck! Whatever you choose will be wonderful. It’s good to have so many options! When I was a kid, I had the attic room and I loved it! I loved that it was quirky and had odd angles and that I had my own little hideaway. My sister has actually revealed that she was really jealous that I got the attic room. Granted, I was about 7 when I moved up there (we shared a room for about a year prior), but I wouldn’t rule it out! 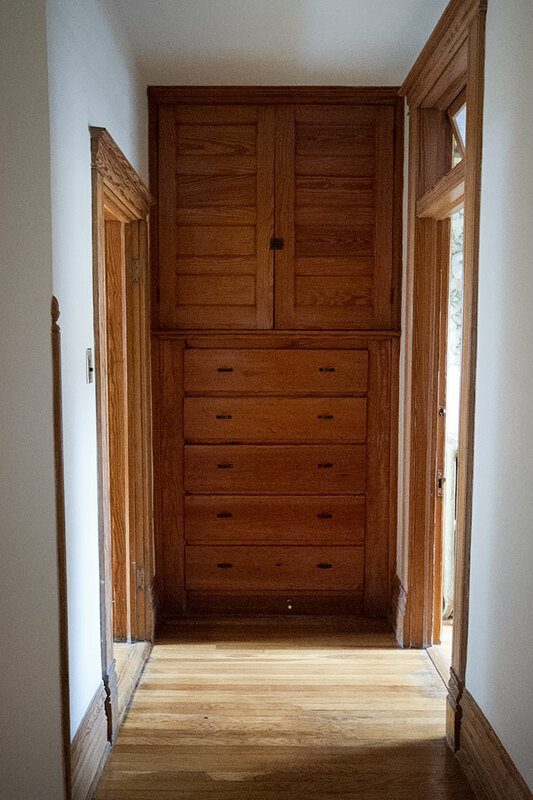 To keep the built-ins, move them, or create new into the area you have marked as “hallway (open up that door)”. Build it into the shared wall between the hallway and the “new closet”. Yes, I thought about that too! I doubt they could be easily moved though, so it might be something that wouldn’t happen right away. I really prefer to have everyone on the same floor, especially while the kids are young, so I’d go with your mom’s idea. 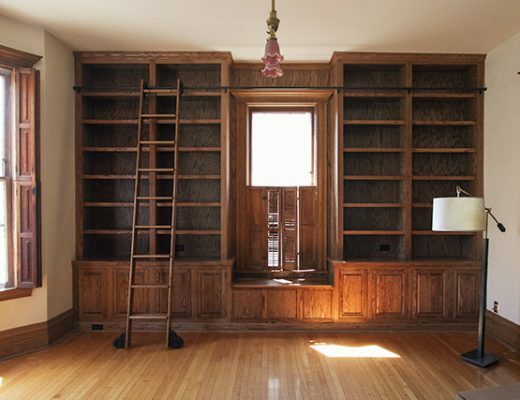 Sure, built-ins are nice, but there are probably other ways you could somehow get that storage back. Then the attic can one day be an awesome hideway for the kids. 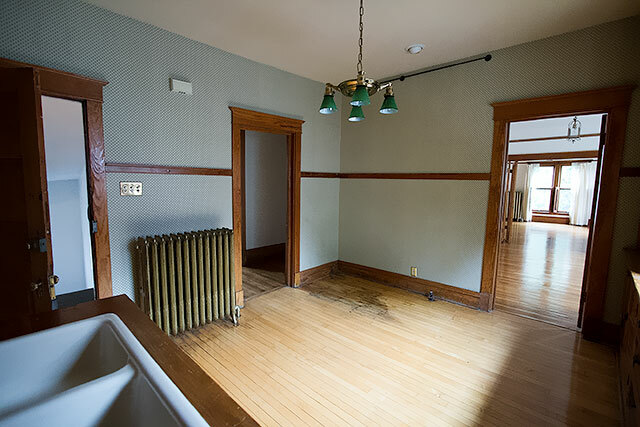 As a lover of restored homes, I would vote for returning the second floor to 4 bedrooms and using either the living room or the kitchen as bedroom 4. 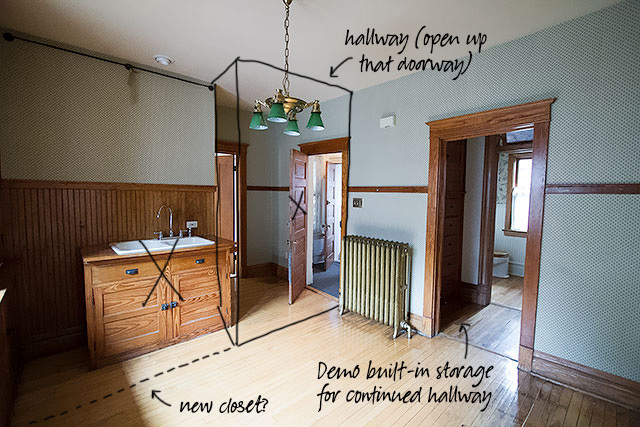 As for the hallway built-in that would have to be taken out… I wonder if there is a space in the hallway close to the bathroom that it could be relocated to, its a built in so it would nest into the cavity of the wall. I agree that it makes sense to have everyone on the same floor. Baby goes into the craft room, but I would actually consider keeping the sink in there. Would that not be handy being able to do a small amount of prep and cleaning of baby stuff right in his or her room? Says the woman with no kids. I haven’t been through the motions of little ones routines so forgive me if there are some serious plot flaws there. p.s. I would absolutely die to have your house. I seriously adore quirky older houses with rooms that don’t match up. It’s so inspiring compared to cookie-cutter houses nowadays. We learned to love it. We always talked to each other at night through the open door. We have a six year age difference and it was honestly just never a problem. You make it work. I am having trouble visualizing this. Can you make a floorplan? I think you should change the room by yours into the nursery and than make the walk through area the family room, the built ins would be great for that and its a logical place to have walk ins. Remove the sink area, move your craft room upstairs and bam, save money and have nice flow. Forgive me if I missed this but could you convert the current family room into the new baby’s room and convert the old kitchen into the new family room? This would allow everyone to be on the same floor but without such drastic remodeling. Plus there is the added bonus of being able to keep the built-ins for toy/etc. storage and not have to worry over the flooring issue. There may be something I missed about why that wouldn’t work but hope this helps! That’s one of the options, yes. It’s not my favorite option, but it is one of the easier ones. I know it sounds like a lot of work (and $), but I think the best solution would be to convert the kitchen to the nursery. Having all the bedrooms on one level will bring peace of mind and be a great selling point for future buyers. The only other solution I could potentially see is the master bedroom move to the now “family space” and the “kitchen” becomes the new “family space”. Then, the nursery would be the now master bedroom. I don’t really think this would be the most ideal option because you would loose the beautiful windows and closet in the master bedroom, but thought I would throw it out there. I think in the big picture, restoring the original layout is the right move. I get what a loss those great built-ins outside the bathroom would be, but the flow seems so choppy this way. Also agree with comments that you should do it in phases, remove only part of the kitchen cabinets, etc. I don’t know if I’d demo anything. The kitchen upstairs could work, but can’t you close it off but work around the current built-ins? It works so well as a multipurpose room that you might regret removing everything very soon down the line. I really like converting the room adjacent to your bedroom. It seems much more like a “can be adapted to be a nursery, but can also be adapted right back if we someday change our minds.” It wouldn’t surprise me that in a year or two August will want the upstairs room anyway. Maybe you can move the adjacent room into the upstairs kitchen and work to convert that space (in a non-permanent way) into an upstairs family-type room? Those built-ins are just so great… I’d really discourage their destruction. What about using the kitchen as the family room and then turning the family room into the baby’s room. If it’s large enough, perhaps you could keep some of the kitchen built-ins and include a wet bar or something along those lines with a sofa and TV, etc. Maybe it’s just too small? It’s too small to do all of that, and the cabinets, four doorways, and the radiator limit furniture placement. I LOVE the idea of taking the house back to what it used to be. That room is always going to be awkward and I don’t think you’ll ever regret losing that little bit of storage – your house is huge – you can always find another place for stuff. And the value of adding back a true 4th bedroom on the same floor is fantastic. What a great house!! That’s how I feel about it! Brandon’s not on board though, and obviously not everyone agrees in the comments either. Is there anyway to combine the bookcase building with remodeling the kitchen aka potentially third munchkin’s bedroom? Get the construction out of the way all at once? Sometimes it offsets the costs ever so slightly but enough to get it all done at once. I was still secretly hoping you guys would keep the extra kitchens/apartments and run a glorious bed and breakfast. No plans for a B&B, but we are going to get an estimate from our carpenter! I can’t remember if you said the sink worked or not, but you might find it convenient for a while for diaper changes etc. We have pictures of my parents giving us baths in the second kitchen sink that ended up being my sister’s room when they lived in a house that used to be a duplex with a unit on each level. I appreciate having us all on one level for sleeping. But I am also grateful we finished the brunt of our remodeling before the baby arrived – even if I was rather useless for much of the manual labor. The sink does work. There’s a vanity sink in my closet that didn’t work when we moved in, but upon further investigation, the supply lines were just turned off because the pipes underneath drip. Why not use the attached room for the baby and use the 2nd floor kitchen as family space? I would keep everything as is right now. I’d put the baby in the kitchen and keep the sink. That’s a real bonus with a baby. Wait for two years then reassess. You’d save money and you’d get a clearer idea of what would work for your family. The baby will probably only sleep in that room, and spend all of his/her time on the first floor or in the room next to your bedroom. And who knows, Eleanor might want her own suite on the third floor to get away from “the boys” if you have a boy. Good luck. 1. Move the craft room to the third floor. 2. Remove the sink in the kitchen (this would be the only construction). Move the living space into the kitchen. I think placing the couch where the sink is and the tv across from it would give a good layout. Use the cabinets for family games storage. 3. Turn the living space into the nursery. 4. Down the road when you won’t appreciate a nursery next to the master bedroom anymore, and you’ve saved up some more money reconfigure the 2nd floor to it’s original layout making the kitchen a bedroom (for baby #3) and return your living room to your living room. This way you do the least amount of construction and you aren’t backtracking. You’re able to enjoy your house and not feel like it is awkward and in-process. Don’t board up any doors. And you have more time to think about that hallway closet storage loss and how to remedy that with the conversion later on. A good plan, though the kitchen doesn’t suit itself well to the family room — even with the sink removed. The layout is awkward. I see a lot of people suggesting taking out the cabinetry under the window but leaving the cupboards on either side. I think the opposite (kind of). If you took out everything above counter-height, you could have one long storage along that wall for toys, books, games, and baby things. A changing mat could go on one section with supplies. How beautiful that would be! Plus you wouldn’t have to worry about changing the floors! Whatever you decide to do, PLEASE don’t get rid of the wall of cabinetry in the kitchen!!! It adds so much character and can be used for so many different things. It doesn’t look kitchen-like at all to me, and I think it would be a huge mistake to take it out. It looks so kitchen-like to me because it is exactly the same configuration as the cabinetry in the main kitchen! Just wanted to say that you have THE coolest house. I am so jealous, but I really love seeing what you’re doing with it, and how creative you guys are with using it! Congratulations on the new little one! I am 14 weeks with #4, and stressing a bit on how to fit him/her in our little 3 bedroom! Gonna be sharing, for sure- just have to figure out the right configuration of kids for that. :) Good luck! Congrats to you, and good luck on finding the best configuration! I’d turn the room off your bedroom into a baby room. And put the family room stuff in the kitchen. You can always reshuffle later. But I’d do the simple option now. Plus, by the time you want to shuffle – maybe one of the kids will really want to move upstairs (that low window makes me nervous though). If you do make the kitchen into the baby room – I’d leave those cabinets for clothes/storage. I might leave the sink too – it would be totally convenient to bathe baby in that sink! Congrats on the baby too. I predict a boy! The window makes us nervous up there too. We’d put window guards up (which unfortunately are pretty ugly and look like horizontal bars). With a baby (and future toddler) who will be napping for at least the next two years (at least let’s hope! ), plus possibly going to bed earlier than everyone else, my biggest concern would be people walking through his/her room to get to other parts of the second floor… my own toddler is napping as I type this, in a nearly pitch-black room, and it’s just hard for me to imagine cracking open the door, closing it super quietly behind me, and tip-toeing across the room trying not wake her up. So personally, if I had to prioritize, the room configuration would be my big thing. On the flip side I could live with those “built-ins” for a really long time and would actually love a sink in a baby’s room! I don’t like the idea of having to go through the baby’s room on a regular basis to access parts of the house because of that. If I was 6 and mom was having another, I would want the attic space for quiet. I would rock paper scissors all day for it. It could be really fantastic and private, magical haven. Margot Tenenbaum, but happier. I had 2 sisters that invaded my space constantly, clothing, tore pages from favorite books to give to dumb boys they liked. We’re wonderfully close but they still drive 4 hours to peruse my wardrobe and rip pages from my magazines 20 years later. Sigh. I understand that you like having the family room connected to your bedroom, but it seems like that connection might be the only reason not to put the baby in there for now. So I guess your decision depends on how important that connected space is to you. My vote is with those who suggest putting the baby next door to you and moving the family room to the kitchen. That way your only construction is taking out the sink, and you get to keep all the storage (which would be excessive in a nursery, but really useful in a family room), saving $$$ on the floors. The craft space goes upstairs, and everyone sleeps AND hangs out on one floor for now. And the now-kitchen, with its multiple doors, might still feel connected/open to the rest of the floor? It seems like that would be the least expensive plan, and involve the least work for you RIGHT NOW. Babies don’t stay babies for very long, so pretty soon your family’s needs will change again, and then two kids can share a room or someone (or two) can move up to the 3rd floor, and you can reconfigure the 2nd floor to suit your family’s long-term needs. And we’ll enjoy reading about BOTH phases of change! I have never de-lurked and commented before but I just had to – keep the sink ! What an amazing luxury to have a sink right in your nursery. Perfect for diaper changes and the most convenient, non backbreaking baths! You could put a change table to the left of the sink or use the space under the window – lovely for baby to gaze out.You could easily take some shelves out of the cabinets and put in a pressure mounted rod for hanging those little clothes. Anyway- there’s my 2 cents. And warmest congratulations! I second keeping the sink. Would be fab for diaper changes! My suggestion would be to have the baby sleep in the room off yours and keep this room as a family area where you could hang out and play and change the baby! I vote the same way. Having all those cabs and a sink for a changing area, toys, etc, would be incredible! the sink counter would make an amazing changing station! So no demo needed. Just some furniture moving around. Yes. I definitely agree to keep sink. Would be a great benefit. A bathroom can be seen from your photo. Why even bother shlepping when you already have access? Also shelving in middle, w windows, that could make a wonderful changing station! Seems as if you have a few ideal options Nicole. With your talent, make it lovely w decorating! I don’t have a great handle on your floor plan, but my vote would be to convert the current TV room into a nursery. It sounds like a much simpler and less expensive option, plus it’s easily accessible from your room. 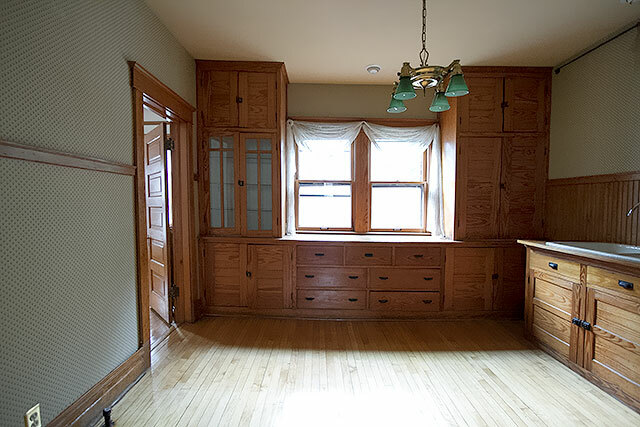 Plus, then you wouldn’t lose your nice built-in storage (a perk of owning one of those old Victorians) or your potentially great studio/craft room — the upstairs kitchen with its sink, ample cabinets, etc. Since you have the two parlors downstairs, is there a way you can configure a TV in one of them that is comfortable for your family and aesthetically pleasing as well? We can move the TV downstairs easily enough. First off, CONGRATS!!!! I’m excited for you guys! We asked E, and she was pretty hesitant. She really likes her room where and how it is. August would probably be the one to go upstairs, but he’s only three. All I see when I look at those pictures is a changing table under the windows, and a place to wash your hands after a diaper change! Talk about perfect! The rest can be changed later. Adding rugs, a crib, rocker, etc will create warmth and take away that kitchen feeling. There is a sink right across the hall in the bathroom too though! Yes! I observed that immediately. Love it. So much space to store everything. An amazing lifesaver with a new baby! My poor niece is constantly struggling to find space w 2 kiddos. Second bebe was a daughter. Things are tight. Let alone clothes, you wouldn’t believe the toys! Yikes. Could you switch your bedroom with the “brown town” room and then use your current bedroom for the nursery? We like our bedroom where it is. If we’re getting rid of the brown room, we’d just make that the nursery. My three grown girls would have given anything for an attic room growing up- Consider that! My older sister had the “attic room” in our house. Us younger kids were always incredibly jealous of her getting an entire floor to herself in spite of the always fluctuating temperature and animals scurrying through the walls regularly! That being said she was older than your kids when she first moved up there. I can’t imagine that my 4 year old would handle it well. And Eleanor doesn’t really want that room (she likes hers a lot), so it would probably be August up there. He’s only three. My great nephew Eli is 3. No way would he be separated from his mama! Haa. Too young. I am another vote for keeping the built-ins and putting baby in the room adjacent to the bedroom. I think the built-ins are really pretty, and could be so useful (including the one in the hall), and you don’t lose “family” space this way. I like the attic as craft/family space, private and separate from your “public” family spaces. The built-ins are fine — they just say “KITCHEN” to me because they are exactly what we have mirrored in the kitchen downstairs. Oh those cabinets and wood….have you heard of Miss Mustard Seed Milk Paint or Anne Sloan Chalk paint?? Those cabinets would be awesome in a color and new hardware that would totally get rid of the “K” look. The paint is way simple to use – no VOC, no messy prep. Nothing like your SW or BM paints. Now as far as all this which room stuff – have the baby, experiment, which one should ultimately serve what purpose and then execute a plan so you’re not sorry having made changes now. You can fix it up to look non-kitchenie Nicole. Give it a try. Moving things around comes second nature! Got to think of things being easy on you also. Eleanor and August should definitely keep their spaces. August may be fine with moving upstairs. BUT…Just something to think about…I volunteered to move to another floor when my youngest brother was born. I was even excited about it, but once there, I felt so displaced and separated from the rest of the family. Just some food for thought. If you’re going to do that, do it now, and see how it works out. That way, he won’t feel like maybe the baby took his place. Thanks. We had a similar transition with Eleanor at the old house and made sure to put a little time between her switching rooms and her old room being the baby’s. You’re idea! I mean, it’s really a no brainer. I realize the built in is cool and all, but seriously who needs a whole second kitchen upstairs!? I would do what your mother suggested as well! The pass through/hall doesn’t have to be done right now, but a room for the baby? Um, yeah! The attic wouldn’t be a contender for any of my kids if they were under the age of 5! Now…my one thing is that I think I’d leave that wall of built ins!!!!! Do not take them out. I think you could reconfigure at least the upper cabinet part into bookshelves and that would be AN AWESOME feature in the baby’s room!! ALL.THAT.STORAGE!! OMG…heavenly for a kid’s room! So, summing up. You are right. You’re husband is wrong, lol (though I appreciate his fondness for the built in). I don’t think it would cost that much really…but for the flooring situation, but that just can’t be helped. If you had to, you could just pull the newer floor up and put down prefinished flooring…or…just for the time being and it might be cheaper…have underlayment placed if the floor is uneven where the cabinets came out and get some nice carpet laid just until you can afford to address the floors better in the future!! Again…REALLY consider keeping those cabinets. I can already see a room set around that wall for a child just from your photos! I’m fine with keeping one set of built-ins or the other, but there’s no way to create a hallway, keep the bathroom storage, AND keep the kitchen cabinets without creating a very narrow, awkward room. Or we have to use the baby’s room to get to the stairs and to another bedroom. Having parents and kids on the same floor is apparently super desirable and very functional. So, if you say that you can fit the entire family onto the second floor, I would definitely go for it. I looked at your post “the rest of the second floor” and this room: what are its dimensions? In the pictures in this post, it seems very big, but there’s definitely some distortion from the camera lens and maybe it’s actually medium/normal size. Also, what’s on the other side of the cabinetry that’s providing storage for the bathroom? There’s a window back there, and… another room? I’m wondering if you even want to have a hallway heading back there. Maybe THAT extra room, if it’s poky, can be baby storage or could be a baby walk-in closet, or could be a future “secret room” for a kiddo. It could be cool if it’s not accessible to anyone but Baby 3. I would like to note that my thoughts are predicated on how I always feel like expectant women should have it easy, and shouldn’t have to live through demo if it’s going to be annoying to them. Ha! Yeah, we’ve got character out the wazoo. The kitchen is about 12×12, but the wall of cabinetry takes up almost 2′ of depth. The back room you see is another bedroom, so that’s why I’m concerned about having a good way to access it. I see your point about the cabinetry, if it’s taking up 2 feet of floor space. And that back bedroom, would you even use that? Would it be a guest room or something? I mean, making it accessible makes sense (A+) but if you don’t actually have a use for it now, you could use the bedroom back there as the baby’s closet. That way the bathroom would keep its storage. OR! Or! This is a good option: you can remind me that I just moved into a house and maybe I would like to decorate/strategize my own house? It’s a thought. LOL Maybe less time “helping” Nicole, more time unpacking boxes? Hahhahah but seriously I really should deal with my own fixer upper. I would make the current family room (aka brown town) the nursery. I would convert the attic to a large and comfy family/tv room area. The old kitchen could become a really awesome and large bathroom/linen closet. Losing the storage would be a real shame. Wait a sec…I change my vote. I wouldn’t do a thing to that room other than freshen up the walls etc…change the fixture and close those doors! Everyone who posted about the sink is right!!! At least until the baby is a year old…that big ole sink is where you bath him/her!!! OMG…how freakin great would that be!! A changing pad under that window and the baby’s bath things over there at the sink!!! Imagine a shelf above the sink filled with baby toiletries and supplies…a sweet print themed around bathing a baby!!! KEEP THE SINK too!! You could turn this room into a killer/unique nursery and it wouldn’t cost you hardly a thing girl!!! I vote old kitchen conversion into nursery!!!!!!! Your plan seems the most logical in ultimately creating the most functional space for your family. That said, the nursery was often connected to the master bedroom in Victorians, so using the “brown” family room would be a great option too, and perhaps in a year or two Eleanor or August would be more capable and excited about moving upstairs and another switch could be made? I grew up in a big family and it seemed we were always switching rooms. Think of it as more opportunities to redecorate! As a kid, I actually would have LOVED a space like your third floor potential bedroom. Something really cozy-feeling and safe, like a cave/hideout/fort. I always preferred smaller rooms throughout my childhood, even though I was the oldest kid so I got first dibs when we moved (my dad was in the army, so that was every two years usually). I vote for not changing the former kitchen! I love the built ins, though I do see how they severely affect potential layouts of furniture. I was going to pipe in here with my two cents, but my ideas have already been shared. I love that you have a room next to your bedroom, the brown room, that is a great family spot. I wonder if the kitchen could be used for that purpose instead. While the built in storage may shout kitchen to you, I am sure you could do some tweaking or accessorizing that would make it feel unique to that room. I mean, think of the storage! Then you wouldn’t have to worry about the time and expense and headache of halls, doorways, storage and, let’s not forget the wooden floor project that would ensue. I know children on separate floors can be done, but it really is nice to keep family close. That being said, it isn’t my house, best of luck to you in your decision. And, I am really excited about the new look on board for your bathroom. Looks fun! I vote kitchen for the nursery as well! I don’t really understand why you have to do the hallway reno? And while the sink may be practical… I’m thinking it would be a little (a lot) weird aesthetically and eventually a potential danger even. BUT please don’t take out the built-ins! I don’t think they look kitchen-y and they would cut down on the furniture you have to add to the room and you wouldn’t have to frame out a closet either. Storage galore! Either way though, I’m sure excited to see what you do!! My two cents? From the photos the cabinetry looks really well made and high quality. My kitchen cabinets are complete junk (built of scrap boards by this house’s original owners in the 1960s), so any talk of demo-ing something so beautiful makes me feel a little sick. If you MUST remove them, could I persuade you to carefully remove them and donate them to Habitat for Humanity instead of just tearing them out and hurling them into a dumpster? Pretty please? I say leave as is! What a great room. Baby isn’t going to care and can use it for a couple of years. 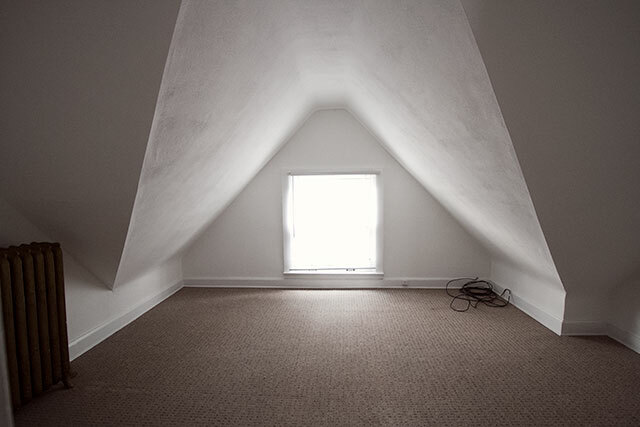 By then, E or A would love the attic room – that could be such a fun room. And then you have the craft room back again. I didn’t read all of the comments, so I don’t know if this was already suggested. But I would not demo the hallway storage. I would re-route the hallway through the kitchen/bedroom conversion. Just build out that part of the interior of the room to make a jog in the hallway and use one wall of the build out for your door. Oh, and yes, I’d definitely use the sink area for a new closet. But I think to avoid changing out the flooring, because it is beautiful, IMO, I would keep the built ins near the windows. I think you can make them work. My .02, anyway. We do a lot of re-configuring spaces, my husband and I.
Oh. I absolutely adore the storage cabinets in that hallway. Just so nice. Definitely helpful. All my old Marimekko linens would love that space! For fire safety I would want all kiddos on the same floor as our bedroom. I also would not want to touch the lovely built-ins. You may find that once the kitchen sink and appliances are out of that room and it’s been converted to a nursery that the built-in will look bedroom-y. Having to go through a room – how quaint – would be part of the charm of living in an old house, I think. We readers are all imagining ourselves in your place and loving it! What a wonderful opportunity you have and how we love that you share it with us! Make the upstairs kitchen the family space and make the room next to your bedroom the nursery! What if you got rid of the sink and gas hookups and just removed the upper cabinets so the floor is still covered by the lower cabinets and you could use that as built in dressers. Nicole – I am with your mom all the way on this one – save money – save stress – keep your family room and storage and do in stages. When walking through the room becomes an issue, then make a decision – little ones will be older and you will not be pregnant! You can do so much to prettify that room. I am in the ” remove sink” camp in order to make this work and be less kitcheny. Also, if those cabinets are not original, they are painting candidates! Just my 2 cents – no charge!! Oo – I think that would be a great built-in feature for a bedroom if you ripped out just the upper cabinets and left the lower as a giant built-in dresser! Then you’d have a sort of extended window seat over the drawers, and you wouldn’t have to worry about whether the flooring extends! I think the second kitchen has got to go – sink, built-ins, etc. But, take your mom’s advice and give yourself the gift of time. Do the bare minimum you need to do before the little one arrives, and finish up as time and your energy allows. It will be awkward at first, but you don’t need the kitchen remnants, and it will eventually help return your house to feeling like a cohesive space for your family instead of reminding you that it used to be apartments. Plus, it’s very cosy to think of everyone having their rooms on the same floor. The attic would make a wonderful playroom or studio, and the current one could become more of a craft room if you went that route. It might have already been said, but I think the attic could be a really fun room for one of your bigger kids. It doesn’t have to be like the orphan’s room in A Little Princess! When I was little, I always thought friends with attic rooms were the coolest because it feels like a secret den or clubhouse ! My vote is use the kitchen as the bedroom. I understand wanting to pull out the cabinetry. But, I would rebuild useable cabinets in the same space (hanging closets on both sides with lower drawers and a window seat! I always wanted a window seat in my room (still do). Then you could pull out the sink and the crib/bed could go there (instead of building a closet). As for the hallway, I would wait and do that later when privacy becomes necessary. By that time, one of the kids might want to move up to the attic and then voila… you will have a library/playroom with a window seat AND can keep your storage. First, congratulations on the baby news! Second, I die every time I see pictures of your gorgeous Victorian. Oh my gawd. For reals. I know that old houses have their perks, but I am so glad you appreciate the beauty of that house. My two cents: don’t demolish those built ins!!! Use them! They are gorgeous. Leave them, please! 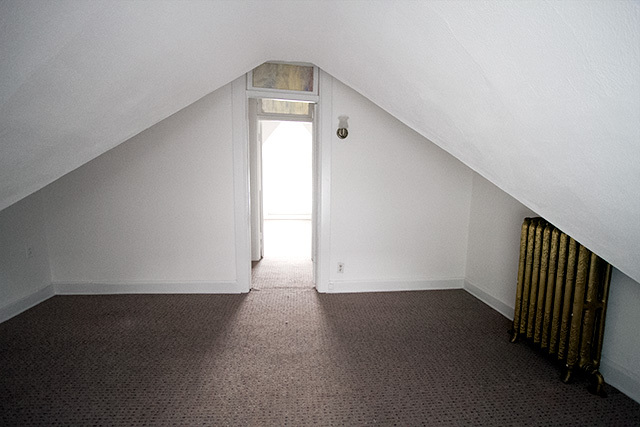 How about converting the attic into a super friendly family space and using that adjacent room as the nursery? As your family grows bigger, you might want a bigger space to hang out in and the attic might be perfect for that. Anyways, these are fun problems to have, no? :) Good luck! Make the second floor kitchen into the craft room and the sink will be a bonus. Make the brown room a nursery. Wait a few years and see where your then older children want to land. As long as Mama is near, babies don’t care a bean about surrounding or space. Read The Saturdays by Elizabeth Enright (save for kiddos later) and you will envision the ex- kitchen as the hang out that family called The Office. Otherwise I agree with Brandon, losing that storage for your main bathroom would be a shame – five people with only a medicine cabinet? Yikes! Could the old kitchen become the family/TV room (and stay a walk-through) freeing up the current family room to become the bedroom? The build in cabinets would be a wonderful reading nook. Remove curtains, install childproof locks on windows, add a cushion and pillows. Remove doors on upper shelves and use for books, toys, etc. You are always great at finding interesting knobs so switch the bottoms out for something fun. Get a small ladder- your older kids would love it. You can put a safety gate between the cabinets during the unsteady years and until the new little one learns where the edge is. Personally I would do the above and keep it an art/craft space. I know several family with large homes whom intentionally have their kids share rooms because they feels it is emotionally healthier and teaches valuable sharing/relationship skills. They only sleep in the rooms but encourage whole family play in play area thru out their property. You have wonderful opportunity to create lot of unique play spaces where kids would love to come over and play at the rainbow house. As they get older, they can each have their own special interest play room if you feel they need their “own” space. Just thoughts. I think without the sink the other built-ins won’t scream “kitchen” especially filled with wonderful baby things. You might be able to do with out adding an actual closet by adding a clothing rack to the tall cabinets to the left of the window… Heck, you wouldn’t even need a dresser with all those drawers beneath the windows. Ok, I’m practically drooling over your built-ins. I’m a new mom and would LOVE a wall of classy storage in my nursery! :) I think someone else said this, but I’m also picturing a quaint changing station in front of the windows – maybe with a mobile?? PLEASSSSSSE KEEP the built-ins!!!!! They are beautiful and that middle part would be a perfect little window seat for reading, playing (imagine it with a cushion and some cute pillows/stuffed animals). Also there is so much storage with those built-ins you wouldn’t have to worry about a dresser for clothes or any toy/book storage. I think converting this room into a nursery is a great idea – as long as you keep those built-ins (they can always be painted too). Oh, goodness, I died a little when you mentioned removing the cabinetry. Please leave it all there! Work around it! I would kill to have that room with the cabinets and the sink as a craft room/ art studio. I love the hallway storage too. You are lucky to have such a gorgeous house. Lucky for having so many options,in my aparment of 95m2 i have no options for the nursery!